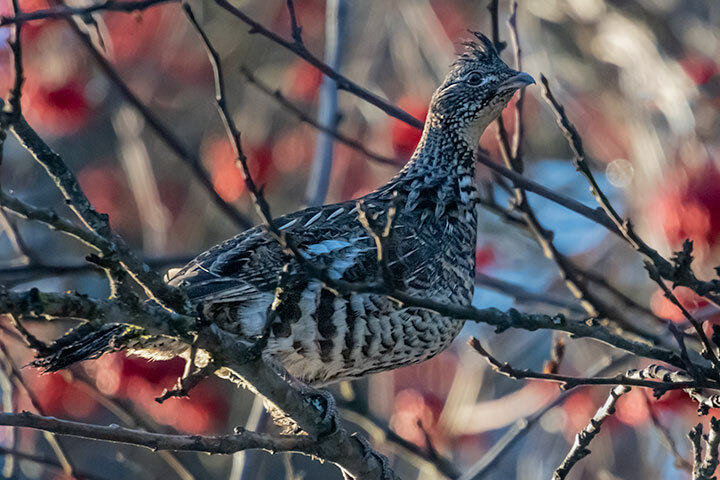 The Ruffed Grouse that visit my yard have long been a staple of my observing, and so is their consistent behaviour: It is a ground-foraging bird. Even with snow, grouse find clearings under trees. In a dozen years of watching them in my yard, yesterday was only the third time I have seen a grouse in a tree. What possessed it to perch on this occasion? A Ruffed Grouse perches in a tree. If they are surprised or feel threatened they will fly up into the closest tree..then they are ‘sitting ducks…but they must feel they are safer..
Allan, I thought afterwards that maybe a neighbour’s cat might have spooked the grouse. Perhaps not the image you’d like, but when they’re perched in trees, a would-be hunter can come along with a noose on a pole and carefully slip it over the “fool hen’s” neck. They seem kind of oblivious when they’re in a tree, for some reason. Better adapted to fleeing on foot? Shirleen, maybe that is the reason these grouse frequent my yard: The only threat I present to them is the possibility that they will be featured in a blog posting. The same day that you posted this I went to my sisters, looked up and a grouse was roosting right out in plain view, in fact the only open shrub in the garden overlooking the lake. Hmmm.